You might have noticed our absence from the Beamblog over the last month. The reason for the lull in posts is the one you now see stretched before you in all its template-ed beauty. We've updated the Beamblog to a new format, one that should prove much easier for us to manage. Little known fact: the old Beamblog required blogger Amber to dust off her late-nineties HTML skills and learn to use angle brackets again. No more shall she be required to Google “how do u caption images html” desperately on Monday afternoons! This new format comes with other benefits. Besides making it easier for our bloggers to post content, we can make longer posts, use tags to filter posts, and upload fancy pictures with ease. In the coming weeks you'll see a wider variety of posts here on the Beamblog. Look for short stories, game session recaps, new contests, and much much more! If you'd like to suggest particular content we should post on the blog, comment here or tweet us at @Beamdoginc . We'll just say right up that we won't be posting anything about Adventure Y before the announcement we're making later this spring (except for that thing about neothelids). Hang on a little longer—the end is in sight! To celebrate the release of the enhanced Beamblog, we're going to offer three posts this week, each one containing special content. Alright, it's actually Earth Day. But our minds often wander the Forgotten Realms and so it's natural for us to think of Faerûn as sort of a second home. For over 20 years players have enjoyed rolling up characters to roam from the Spine of the World down to Calimshan, to sail across the Sea of Fallen Stars to Aglarond and Thay, to delve into the Underdark or venture into the jungles of Chult. As the years have passed, Faerûn's geography has changed but the essence of the world remains. It's still the enchanting high-fantasy setting so many of us have grown to love. Everyone has a favorite dungeon, or kingdom, or city. Our games set in Faerûn have their own diversity of areas, and our players have their favorites too. For our Earth Day contest, we'd like you to tell us your favorite area in any of our enhanced edition games. Is it Durlag's Tower, that dungeon of riddles and traps, in Baldur's Gate: Enhanced Edition? Perhaps it's Ust'Natha, city of the drow, in Baldur's Gate II: Enhanced Edition. 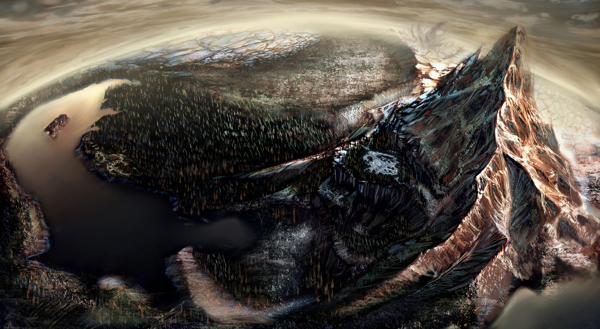 It might be the sprawling Dragon's Eye or the broken Severed Hand in Icewind Dale: Enhanced Edition. Your favorite could be a city, a town, an area map, or even your favorite tree. Like that tree outside of Candlekeep with the diamond in it. Man, what a great tree. Email us at social@beamdog.com with the subject line “Area Contest.” Include your favorite area in the text of your email. The contest begins today, April 22, and ends at midnight on April 29, 2015. We'll post the most popular answers and congratulate the winner in a blog post once the contest ends. Oh, and PRIZES! There are prizes, of course. Our randomly drawn winner will receive a hardcover copy of Ed Greenwood Presents Elminster's Forgotten Realms: A Dungeons & Dragons Supplement. This unique book details day-to-day living in the world of the Forgotten Realms, with all the mystery and intrigue that entails. Two runners-up will receive a Baldur's Gate II: Enhanced Edition t-shirt. Check back tomorrow for our second post to celebrate our new Beamblog!